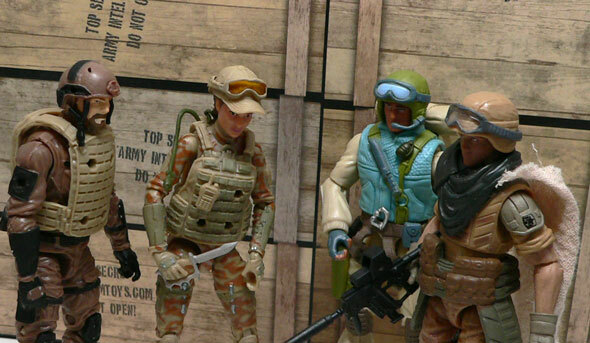 Kickstarter has provided us with a bounty of great action figures in recent times. These include Marauder’s first Task Force outing. 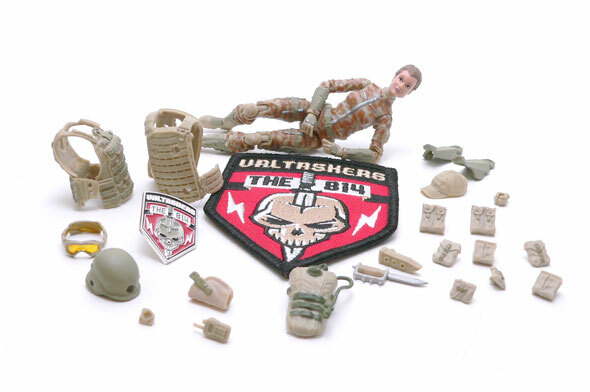 The great thing they did with that KS was to use it to generate the money to buy tooling to create an ongoing source of generic GI Joe style bucks. Their next Kickstarter, no surprise, was for a female version known as a Valkyrie. I have a few different color versions of the first figure. I have to say just by changing colors and adding Marauder accessories, you can come up with some pretty unique characters and build your squads. There was no way I was going to miss the Valkyrie’s first offering. There were plenty of colors to choose from in the Kickstarter. I originally thought I would go with an urban camo, as it is one of my favorites. I went off script, however, and went desert camo. The accessories were interesting, and I thought she would be a nice addition to a squad with Dusty and crew. Part of my choice was also based on the head. This figure came with a brown hair long pony tail. I’m partial to Lara Croft, so that might have been the attraction. The other heads look great for all of the Valkyries from what I’ve seen. I have to say I’m pretty impressed by the paint on the face. The lips look feminine but not over done. The eyes are some of the nicest I’ve seen in recent times on 3.75″ figure. Oh, and that ponytail? Sculpted fantastically. When the female heads become available individually, customizers and head swappers are going to snap these up for upgrades across a number of lines. I was really struck by how much thematically the basic mail and female bucks share. The Val really does look like a female version of the male figure. It’s main feature is that is a very slight build. She’s athletic looking rather than over muscled. One thing that got dropped was the port on the upper arms. I’m okay with this. Even the small pouches would look overly bulky on the thinner arms. A second thing that was dropped was the shin armor. She still has the forearm pieces, though. So instead of armored lower legs we get boots. All of the paint is expertly applied here. I know these figures are a little more than retail, but they have obviously been well thought out and made with care. 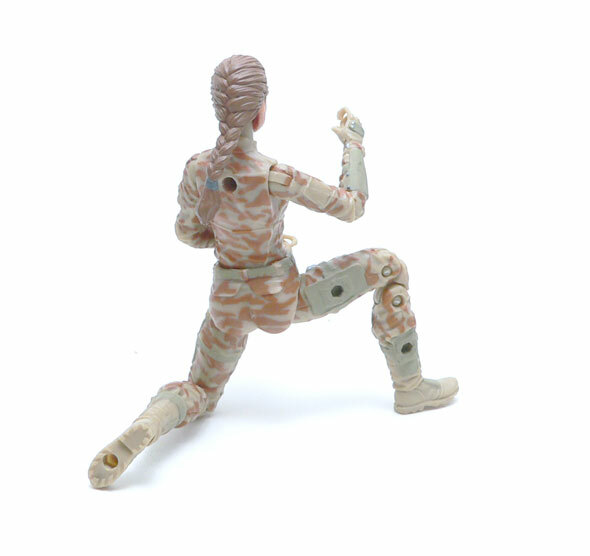 The camo pattern is much more intricate than a lot of mass production figures we see at this scale. The little silver rivets on the armor panels have returned from the male figure, as well. This figure moves just as you would expect. Well, almost. If you will remember, the MTF figures don’t use a mid chest joint. The Valkyrie is not different she rotates about a waist ball joint. 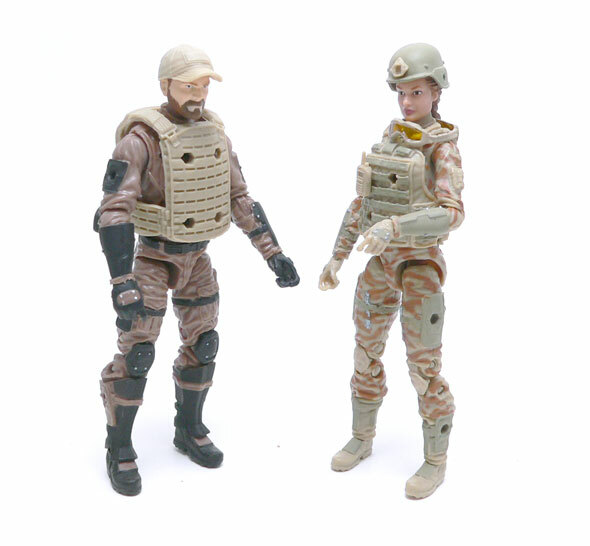 For figures in combat vests, I think this is a perfect choice. It also allows you mix and match tops and bottoms of the various blanks. My one slight nitpick is the neck seems slightly long. When I was putting the head on, I didn’t think it was on all the way because of where it was sitting. I suspect this is to allow for the vests and such. Like I said, it is pretty slight, but if you use her “plain” you may notice it. I will be ordering one of the scarfs when they become available to dress her up a bit in that area, so your mileage may vary. Honestly though, who is going to leave one of these figures as is? Her basic gear has a female version of the plate carrier in tan and green. The extra green goes a long way to bringing out the detail in the molle webbing. Oh remember how I said she didn’t have shin armor? The basic figure doesn’t, but you can use the lower modular points on the legs to add some! I like this idea, it give options that the male figure doesn’t have. You do loose the ability to put a boot knife on her leg, though. For the rest of the modular points on the vest and such, this Val came with a multitude of pouches. Two double mag pouches, two open pouches, two medium pouches and two small pouches and a left standard holster. These are all standard accessories from Marauder in a number of colors. As for new items, she gets a couple in addition to the vest and armor. There is a trench knife with sheath. I think this looks a little bulky for her, so I will probably switch it up with something a little more standard. There’s also a small modular c-clip for whatever you want to clip in. Silencer, flashlight, etc…. Her helmet reminds me of a update of the vintage GI Joe helmet, it even has holes on each side for a visor. In addition, it has a spot of the front for included “Open” plug, or there are nightvision goggles that will be available soon. I think the helmet sits funny on this head, but it’s not my favorite look for her so I won’t be using it. If you want’ there are some amber goggles included you can have in an up position on the helmet or over her eyes. My favorite spot so far for them, though, is around her neck. It takes a bit of that stretch out of the neck and looks like she has just stepped out of a fire fight. The last two new accessories are my favorites. There is a hydration pack that plugs into her back through a slot in the vest. The drinking tube is flexible, so you can flip it over her shoulder if you want. My other favorite is a tiny radio. I’m going to add some paint to mine to dress it up eventually. I really like the look of this on the vests. When the black version comes out, I will be ordering a few. Marauder is known for throwing in extras. The first they included were a new male plate carrier (vest) in tan. I think this works pretty well with my Terra Ops figure. The second thing they included was a ball cap. And it turned out to be my absolute favorite thing. It’s very flexible. It’s also fits this head really well. And it looks great on every figure I tried it on. Again, I suspect I will need a couple more of these. Lastly, for being one of the 814 Kickstarter supporters, the package included a special pin and embroidered patch. Both are pretty nice. The pin will go on my messenger bag for sure! Again, Marauder did not disappoint. There was about an hour after getting my Valkyrie out of the mail that was spent trying out the different gear. My biggest disappointment? I only got one. I want more. 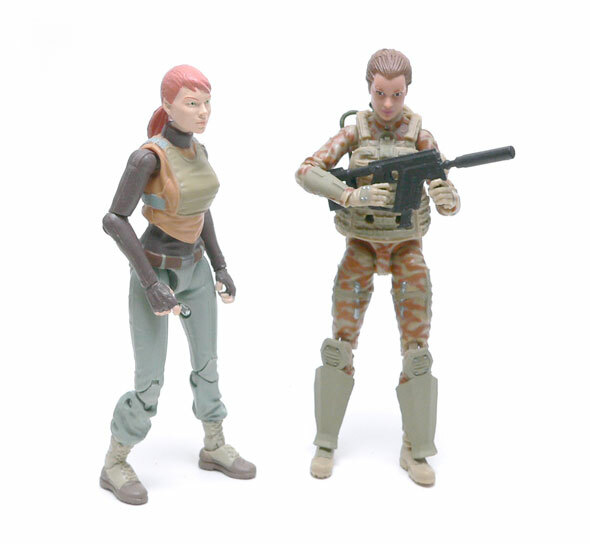 They pair well with the female GI Joe figures, and in some ways surpass them. I know I will be ordering some more of these when they become available on the site. 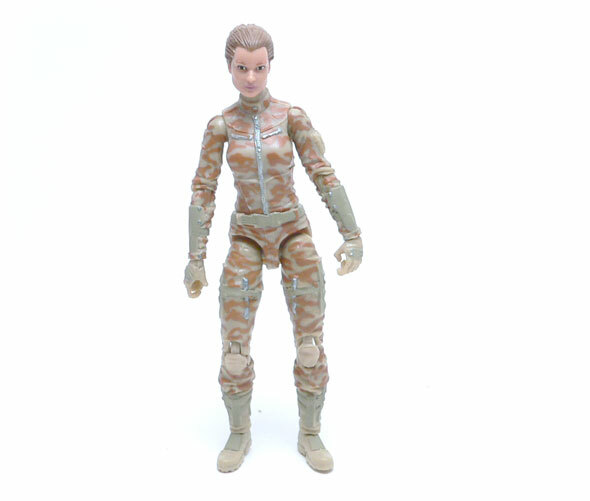 I’m particularly interesting in the t-shirt torso for a kit bash easy custom of Lady Jaye from GI Joe Renegades.